It has been requested that this article be rewritten and expanded to include more coverage prior to 2011. This article is about Nintendo's official magazine. For the Super Famicom RAM cartridge service with the same name, see here. For an alternate name of a video-game competition, see Nintendo PowerFest '94. Nintendo Power was Nintendo's official magazine in the United States and Canada from 1988 to 2012. It covered all of Nintendo's then-currently active systems (and some inactive ones, if there was any worthy news), along with new and upcoming games for those systems. Nintendo Power contained strategy guides, previews, reviews, and exclusive material not made available to other sources. Nintendo Power (or NP) celebrated its 200th issue in February of 2006, and had a major design overhaul in late 2005. On Monday, October 15, 2007, Nintendo of America sold Nintendo Power to Future USA, a magazine company that produces videogame magazines. The magazine remained the same except for a few small changes. After Future USA had taken over, the Player's Guide series was dropped (leaving Prima Games to produce the guides), and gifts could no longer be chosen with subscriptions, as the staff would instead choose one. On August 21, 2012, Nintendo announced that they had opted not to renew their licensing agreement with Future Publishing and that Nintendo Power would cease publication after 24 years. The magazine released its final issue on December 11, 2012. A little over five years after its cancellation, on December 21, 2017, Nintendo of America began a podcast called the Nintendo Power Podcast with previous editor-in-chief Chris Slate discussing recent Nintendo-related events. Power Up, Nintendo Power's news department features an alert on the limited edition Nintendo DSi bundled with Mario Party DS. Warp Zone, which looks back at classic issues of Nintendo Power, recalls the January 2006 coverage of Nintendo Wi-Fi Connection and Mario Kart DS. Four-Sport Hero covers the game Mario Sports Mix and its four sports. Resolution Revolution offers humorous New Year's resolution suggestions to various video game characters such as Mario, Yoshi and Bowser. Donkey Kong Country Returns. is nominated for Wii Game of the Year, Best Wii Graphics, Best Original Score, Best Platformer and Best Retro Revival. Super Mario Galaxy 2 is nominated for Wii Game of the Year, Best Wii Graphics, Best Original Score and Best Platformer. WarioWare: D.I.Y. is nominated for Nintendo DS Game of the Year and Best New Idea. Playback, which looks back at classic games revisits Mario & Luigi: Superstar Saga. Super Mario All-Stars Limited Edition receives a rating of 9.0 out of 10. Community covers fan-made Lego sculptures, quilts and a pointillism mural featuring various Mario-series characters. Jungle Jabber is an interview with Donkey Kong Country Returns producer Kensuke Tanabe and assistant producer Risa Tabata. Warp Zone recalls the 200th issue in 2006 and the 2001 coverage of Paper Mario. Collector's Corner features the Mario diorama rewarded by Club Nintendo. Gaming's Greatest Couples names Mario and Princess Peach the number 2 couple in gaming while naming Wario, Bowser and Master Hand as notable members of the Lonely Hearts Club. Nintendo DS Essentials include Tetris DS, New Super Mario Bros., Mario & Luigi: Bowser's Inside Story, Mario Kart DS, Mario vs. Donkey Kong: Minis March Again!, Mario & Luigi: Partners in Time, and WarioWare: D.I.Y. among its listing of the best games on Nintendo DS. Reviews Archive takes another look at Mario vs. Donkey Kong: Mini-Land Mayhem!. Community covers a fan-made F.L.U.D.D. and propeller helmet and the Mario Marathon charity. Download, the magazine's download-able content section covers the Virtual Console release of Mario Party 2, and gives a staff recommendation. Super Mario Galaxy 2 wins Wii Game of the Year, Best Original Score, Best Platformer, Best Bonus Content, Game of the Year, Wii Game of the Year (Reader's Choice), Best Wii Graphics (Reader's Choice), Best Original Score (Reader's Choice), Best Platformer (Reader's Choice) and Overall Game of the Year (Reader's Choice). Reviews Archive takes another look at Super Mario All-Stars. Community covers a fan-made Yoshi figure. What About Mario covers the revelation of Super Mario 3D Land (then known simply as Super Mario). Warp Zone recalls the 2001 coverage of Super Mario Advance. Reviews Archive takes another look at Super Mario 64 DS. Community covers a fan-made pixel block mural featuring some characters from the Mario series. Dimension Man features an interview with Nintendo 3DS general producer Hideki Konno about Mario Kart 7 (then known simply as Mario Kart), among other topics. Warp Zone recalls the May 2006 coverage of New Super Mario Bros.
Collector's Corner features Mario-series plush toys by Goldie and Mario Kart toys by Tomy. Community covers fan-customized Mario-series mech toys. Warp Zone recalls the June 2001 coverage of Super Mario Advance and the Game Boy Advance launch. Power Up covers the Mario Kart Wii Wii Bundle and the inclusion of Mario Super Sluggers among the Nintendo Selects collection. Both Wii and N3DS versions of Mario & Sonic at the London 2012 Olympic Games are previewed. A Decade Advanced, which celebrates the 10th anniversary of the launch of the Game Boy Advance highlights WarioWare, Inc.: Mega Microgame$!, Super Mario World: Super Mario Advance 2, Super Mario Advance 4: Super Mario Bros. 3, Super Mario Advance, Yoshi's Island: Super Mario Advance 3 and Mario & Luigi: Superstar Saga among other titles as being the best of the system. Community covers fan-customized Pinky Street and Munny figures made in the likeness of various Mario-series characters. Power Up's E3 coverage looks at New Super Mario Bros. Mii on Wii U and Super Mario, Luigi's Mansion: Dark Moon and Mario Kart on Nintendo 3DS. Warp Zone recalls the 2001 release of Nintendo Power Advance, which featured a Super Mario Advance cover story. Collector's Corner features the second assortment of Mario Kart toys. Power Profiles interviews Super Mario RPG: Legend of the Seven Stars, Mario & Luigi and Super Smash Bros. Brawl composer Yoko Shimomura. Community covers fan-customized vinyl toys of various videogame characters including one of Toad. Power Up covers the E3 announcements of Mario Party 9 and Fortune Street. Download covers the N3DS Virtual Console releases of Alleyway, which receives mixed recommendations, and Super Mario Land and Donkey Kong, which both receive staff recommendations. Nintendo's Next Wave, which previews upcoming N3DS games higlights Super Mario 3D Land, Mario Kart 7, Luigi's Mansion: Dark Moon and Paper Mario. Still Super After All These Years celebrates the 20th anniversary of the Super NES including looks back at Super Mario World, Super Mario Kart, Super Mario All-Stars, Donkey Kong Country, Yoshi's Island: Super Mario World 2 and Super Mario RPG: Legend of the Seven Stars. Playback looks back at Super Mario Land 2: 6 Golden Coins. Community features a Nintendo-themed charity art show and a fan-made Peach costume. Warp Zone recalls the 2001 coverage of Mario Kart: Super Circuit and the 1991 coverage of Super Mario World. Collector's Corner features the Mario Kart K'nex building sets. Download covers the N3DS Virtual Console release of Game & Watch Gallery, which receives a staff recommendation. The Nintendo 64 Age of Innovation celebrates the 15th anniversary of the Nintendo 64, including a look back at the many Mario-series games that appeared on the console. Community features a Mario mural and paper collage portraits of various Mario-series characters. That was Awesome, which features a staff member’s favorite video game moments, highlights the use of Kuribo's Shoe in Super Mario Bros. 3. Collector’s Corner features Super Mario figurines from Banpresto. Power Up covers the 42 Wii games that have sold over a millions copies, a number of which are from the Mario-series. Download covers the N3DS Virtual Console release of Mario's Picross, which received a staff pick and recommended rating. The Wii version of Mario & Sonic at the London 2012 Olympic Games is previewed. Keys to the Kingdom previews Super Mario 3D Land. Community features fan-made Spiny Shell RC racers and fan sketches of monstrous interpretations of various enemies. Next Wave covers the 2012 Nintendo 3DS lineup which includes Paper Mario, Luigi's Mansion: Dark Moon and the newly revealed Mario Tennis Open. Warp Zone recalls the November 2001 cover story on Luigi's Mansion. Download covers the N3DS Virtual Console releases of Super Mario Land 2: 6 Golden Coins, which receives a staff recommendation, and Golf, which receives a mixed staff recommendation. Seventh Heaven highlights seven key feaures of Mario Kart 7 and interviews producer Hideki Konno. Think Inside the Cube celebrates the 10th anniversary of the Nintendo GameCube and lists the console's top 25 games which include Donkey Kong Jungle Beat (19), Luigi's Mansion (15), Mario Kart: Double Dash!! (13), Paper Mario: The Thousand-Year Door (9), Super Mario Sunshine (7) and Super Smash Bros. Melee (4). Playback revisits Super Mario World 2: Yoshi's Island. Super Mario 3D Land receives a rating of 9.0 out of 10. Mario & Sonic at the London 2012 Olympic games (Wii) receives a rating of 7.0 out of 10. Community covers a fan-modified Wario bank/robot, a yarn Super Mario Bros. 3-style Treasure Chest and custom Smash Bros. figures. The N3DS version of Mario & Sonic at the London 2012 Olympic Games is previewed. Nintendo Power Holiday 2011 Buyers' Guide suggests the various Mario games of the Nintendo Selects collection, Super Mario 3D Land for the platforming purist, Mario Kart 7, Mario Sports Mix, the Mario Wii and Nintendo DSi XL bundles, and the First 4 Figures Mario Nintendo DS Holder as gifts. The Jungle V.I.P. celebrates the 30th anniversary of Donkey Kong. Mario Kart 7 receives a rating of 9.0 out of 10. Fortune Street receives a rating of 7.5 out of 10. Community features homemade Mario character plushes, customized Mario crossover toys and a unit-origami Goomba. Warp Zone looks back at the 1992 Super Mario comics. Collector's Corner features 9 inch Super Mario Galaxy 2 figures and Mario Kart Wii keychains. Luigi's Mansion: Dark Moon, Mario Tennis Open, Mario Party 9 and Paper Mario (Nintendo 3DS) are previewed. Mario Kart 7 is nominated for Game of the Year (Nintendo 3DS). Mario Sports Mix is nominated for Best Sports Game. Super Mario 3D Land is nominated for Game of the Year (Nintendo 3DS), Best Nintendo 3DS Graphics, Best Original Score and Best Platformer. Mario & Sonic and the London 2012 Olympic Games (Nintendo 3DS) receives a rating of 7.0 out of 10. Reviews Archive takes another look at Super Mario 3D Land. Community features fanmade Bowser and Koopa Paratroopa figures and a painting of Luigi. Iwata Reveals New Plans covers a presentation by Satoru Iwata that announced a new 2D Mario game for Nintendo 3DS. Collector's Corner covers the K'nex Mario Kart track-creating sets. Mario Kart 7 wins Best Racing Game, Best Multiplayer, Best Racing Game (Readers' Choice) and Best Multiplayer (Readers' Choice). Mario Sports Mix wins Best Sports Game (Readers' choice). Super Mario 3D Land wins Nintendo 3DS Game of the Year, Best Platformer, Best Stereoscopic 3D, Finish-Strong Award, Nintendo 3DS Game of the Year (Readers' Choice), Best Nintendo 3DS Graphics (Readers' Choice), Best Platformer (Readers' Choice) and Best Stereoscopic 3D (Readers' Choice). Mario Party 9 receives a rating of 8.0 out of 10. Community features Mario-themed painted tables. Warp Zone looks back at the first look at Wii version of Super Paper Mario. Collector's Corner shows five keychains relating to Super Mario Galaxy. Download reviews Wario Land: Super Mario Land 3 for Nintendo 3DS Virtual Console as well as recommends Super Mario Bros. for Nintendo 3DS Virtual Console, which was made available to the public at this time. Making a Racket gives a full preview of Mario Tennis Open, including an interview with Hiroyuki Takahashi of Camelot and Toshiharu Izuno of Nintendo, the game's producer and lead designer, respectively. The Community section features a painting of the sprite of Cape Mario on Yoshi as well as a cross-stitch of the first Super Mario World map screen. Also shown is two food items from the Paper Mario series as they would look as real-life foods. Games are Art covers Mario appearances at the Smithsonian American Art Museum and The Art of Video Games: From Pac-Man to Mass Effect book. Making Mario interviews Super Mario 3D Land director Koichi Hayashida. Collector's Corner covers Banpresto's Super Mario Mini Figure Collection Series 3. Ultimate Super Mario ranks the mainline Super Mario series games. Mario Tennis Open receives a rating of 7.0 out of 10.0. Community covers a Mario-themed wedding, skateboard deck, cake and LEGO sculptures. Several issues of Nintendo Power have comics within them, several of which make references to the Mario series of games or related media. These comics revolve mostly around the character Nester, who plays various Nintendo games along with other characters. Originally titled "Howard & Nester" (stylized as "Howard & Nester NESTER"), the comics followed both the character Howard Philips and Nester as they played games and gave out tips. When Howard left, the comics were retitled "Nester's Adventures", and the comics followed Nester and his friends for several issues. After a long hiatus, another unnamed comic was made for Nintendo Power's 20th anniversary, which shows a grown-up Nester with an unnamed son. For Nintendo Power's final issue, a comic called "Nester & Maxwell" (stylized as "Nester & Maxwell MAX") was done as a callback to the original comic series where Nester and his son Maxwell talk about Nintendo Power's past. #231 Nester is playing Mario Kart Wii when his son comes in with the 20th issue of Nintendo Power. After talking about the NES, Nester and his son watch The Wizard, specifically mentioning Super Mario Bros. 3 that is played at the end of the movie, and Nester mentions the Super Mario Bros. movie. At the end of the comic, Nester's son gives a tip on how to avoid the POW Block in Mario Kart Wii and the two begin racing against each other. #285 Nester & Maxwell The final comic shows Nester reading the final issue of Nintendo Power in a room with many Nintendo Power-related posters and merchandise, including a poster about Super Mario RPG: Legend of the Seven Stars and the clay models of Mario and Wart that was used for the first issue. In the second-to-last panel, Nester's son, Maxwell, invites him to play New Super Mario Bros. U, to which Nester asks his son to create platforms to help him over difficult pits. Below is a gallery of almost all of the Nintendo Power covers that Mario and others have appeared on. Notably, the Mario franchise has been stated to be the most popular subject of the magazine's covers, having appeared on 57 throughout the magazine's run, including those of both its first and last issues. Issue #90 - Donkey Kong Country 3: Dixie Kong's Double Trouble! Issue #175 - Mario Kart: Double Dash!! Issue #203 - New Super Mario Bros.
Issue #233 - Wario Land: Shake It! In 2001, to promote the launch of the Game Boy Advance, Nintendo published a quarterly spinoff magazine of Nintendo Power entitled Nintendo Power Advance, which featured news, tips and complete walkthroughs for various Game Boy Advance games. It was canceled after only four issues. Mario, however, was featured on three of the four covers (with the remaining featuring Golden Sun). 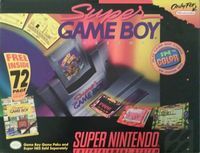 Super Game Boy came bundled with its own guide.